The U.S. Forest Service has waived fees at three national forests in Florida to give evacuees of Hurricane Florence a “free place to stay” until the storm passes and it’s safe to return home. “The fee suspension applies to all Forest Service-run facilities as well as concession-run campgrounds under a special use permit,” the agency said in a Friday tweet. The service opened up the Apalachicola, Osceola and Ocala National Forests in North Florida to hurricane evacuees. It gives the millions of residents fleeing the storm another option of where to shelter. Thousands of people, for example, are taking refuge in Red Cross shelters in the region. Nearly 2 million residents evacuated from the storm’s path. More than 1 million people were ordered to evacuate the Carolina coast Tuesday, when forecasts suggested Florence would hit land as a major hurricane. Many did not evacuate in time or were not under mandatory evacuation orders from state officials. Rescue teams have saved hundreds of people stuck in the storm surge-flooded areas of North Carolina, but dozens more still need to be taken to safety. Nearly half a million people lost power by Friday morning as high winds and flooding blew transformers and toppled power lines. Duke Energy, a regional utility, warned that residents could be without power for prolonged periods of time. Florence’s forward speed has slowed, potentially increasing damaging floods, but the storm will continue to weaken as it moves inland. 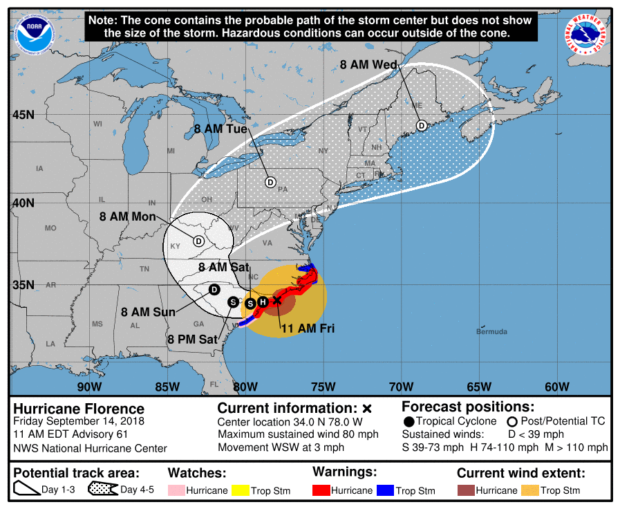 Florence will downgrade to a tropical storm Saturday before turning north, according to the National Hurricane Center (NHC).